Radio Related Novelties Banks, Toys, Games, Advertising, etc. 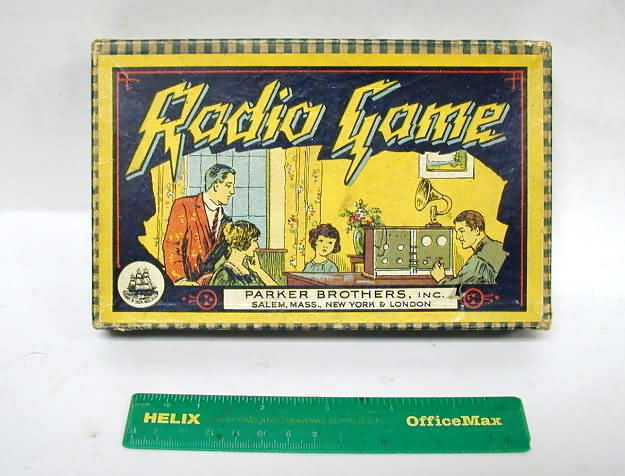 RADIO GAME: Another radio game by Parker Bros., not a large game in physical size but has great graphics. Inside has just some playing cards, no instructions. Sold mainly for the box cover graphics, size 7 1/2 x 4 5/8. 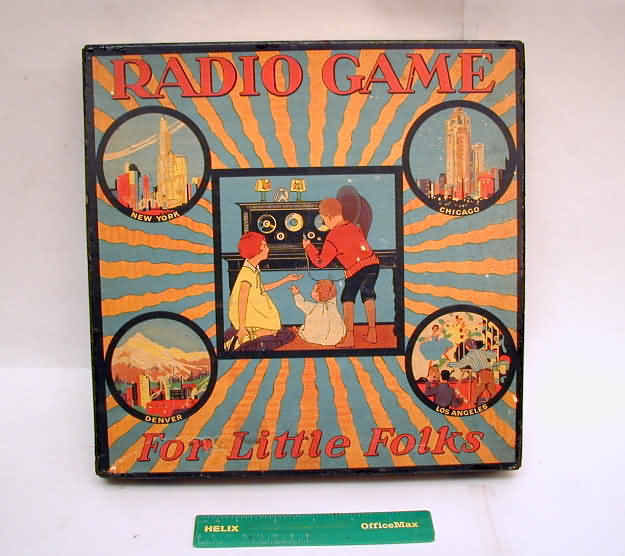 RADIO GAME: A radio game by Alderman Fairchild Co. and copyright 1926. Nice graphic, size of box is 11 1/2W x 11 1/2H. Comes with spinner and 4 tiny metal horn speakers as game pieces. 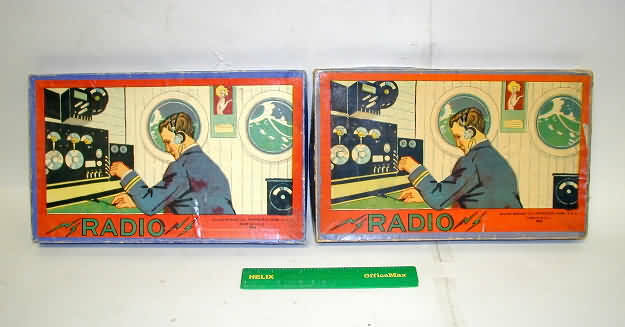 RADIO GAME: Radio game by Milton Bradley, #4884. Nice graphics, age estimated early 1920's. Size is 10 1/8w X 6 1/4H. Left box is good++, right box good-/fair++. 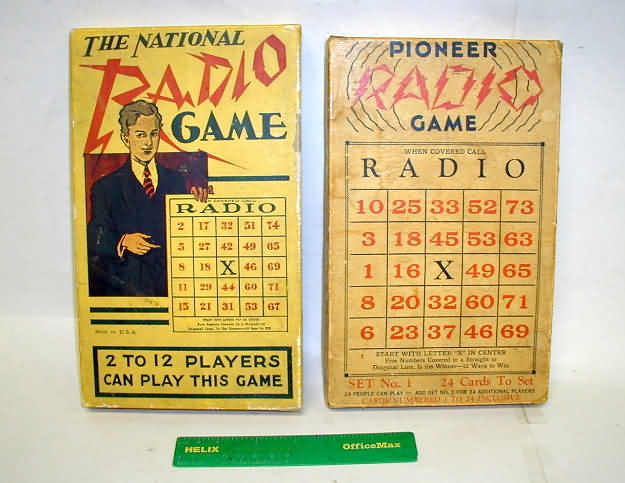 RADIO GAME: Milton Bradley radio game #4625 from 1920's. Large box is 15 1/8W x 9 inches high. Box is good-, makes a nice display piece. 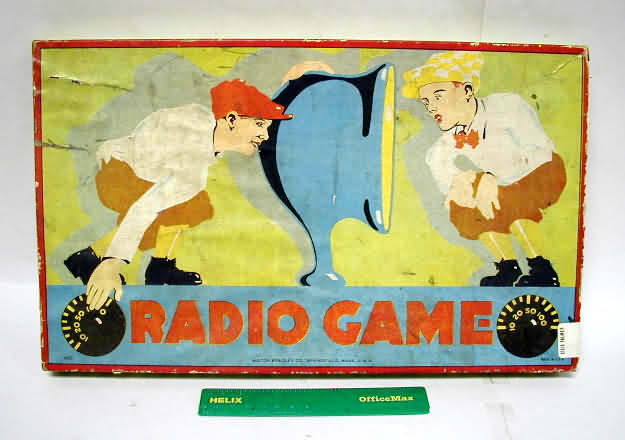 RADIO GAME: Milton Bradley radio game #4625 from 1920's. Large box is 15 1/8W x 9 inches high. Box is fair++, makes a nice display piece. 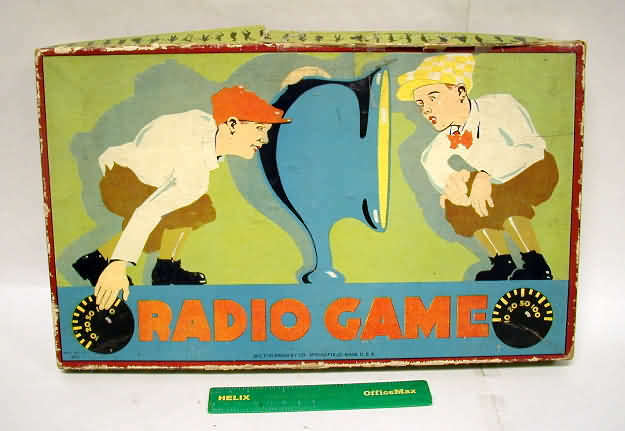 RADIO GAME: Milton Bradley radio game #4625 from 1920's. Large box is 15 1/8W x 9 inches high. 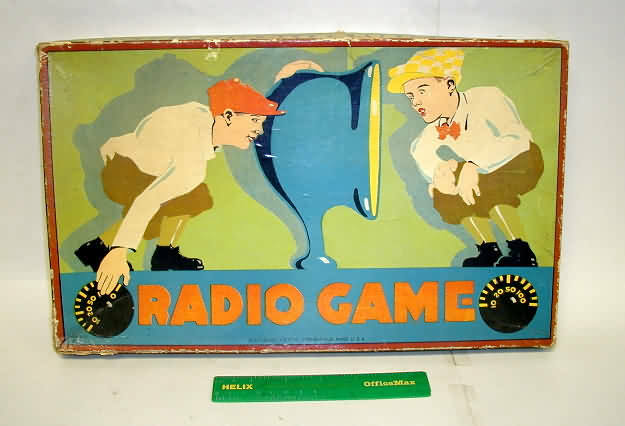 Box is fair, makes a nice display piece..
RADIO GAME: Milton Bradley radio game #4625 from 1920's. Large box is 15 1/8W x 9 inches high. Box is good--, has a crease upper left side. Makes a nice display piece. 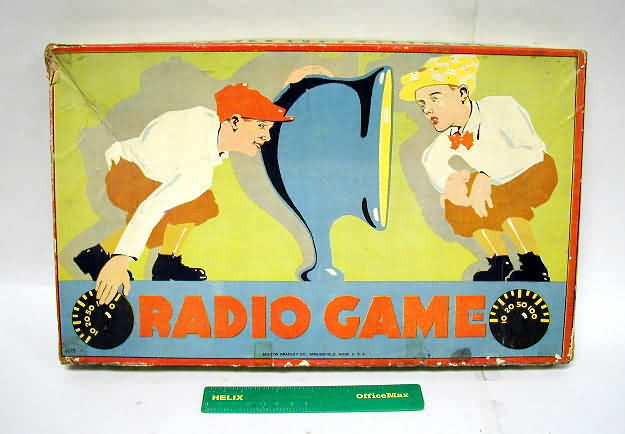 RADIO GAMES: Very popular in the 1920's, this is a take-off of a Bingo game but with the words RADIO. National (left) is 6 X10 inches, Pioneer (right is 6 x 9 5/8H. Both in good condition. 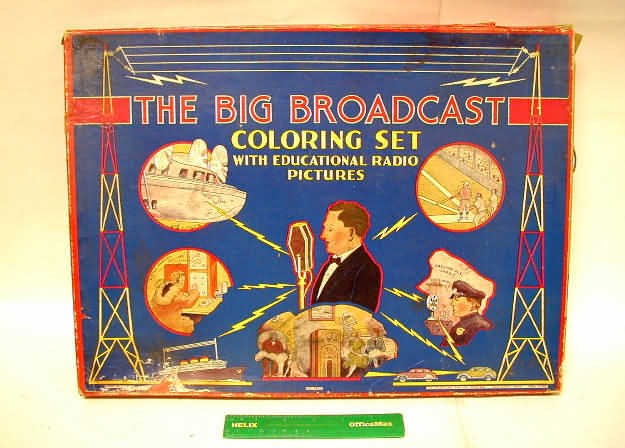 RADIO COLORING SET: A childs coloring set with radio realted graphics. Box is large - 17 1/2 X 13 inches high. In average good condition, sold mainly for cover graphics. 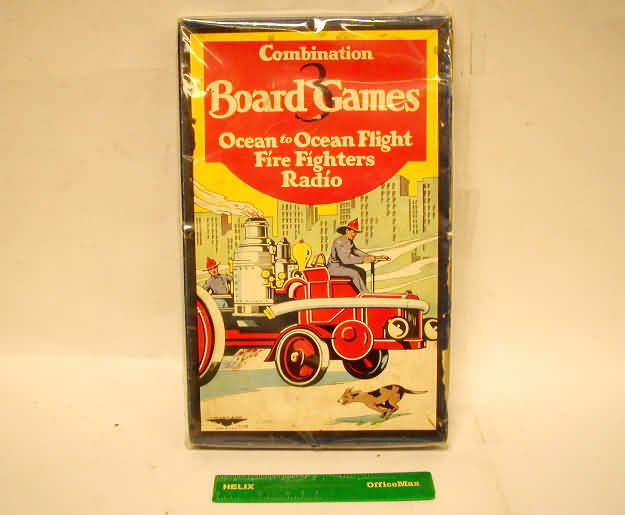 BOARD GAME: A combination board game by Wilder Co., has the word RADIO as one of the games. Size is 7 5/8 x 12 1/2H, good condition except one side flap missing. 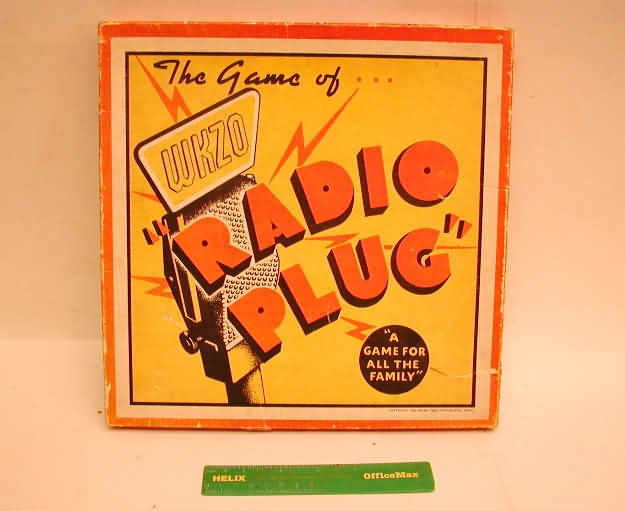 RADIO GAME: Radio Plug WKZO, copyright 1938 by Frank Pero of Kalamazoo, MI. In good condition, 11 3/8 x 11 3/8. 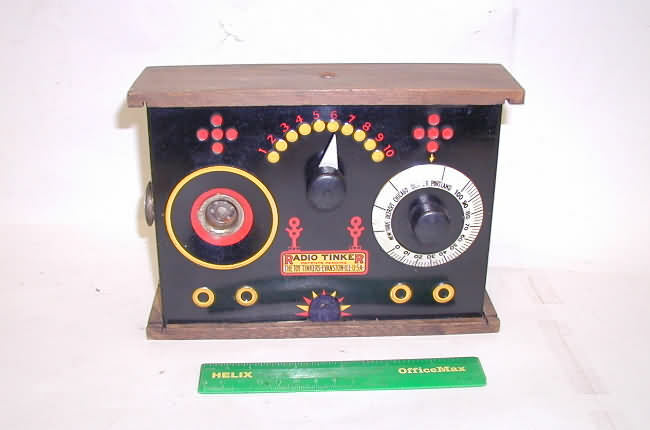 RADIO TOY: A childs toy radio from the 1920's. Called the Radio Tinker Toy by Toy Tinkers of Evanston, IL. Made of lithographed tin with wood top and bottom. Nice condition, 8 1/4W x 6 inches high. 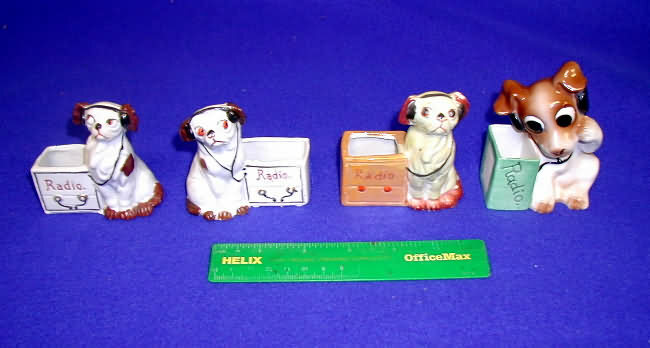 RADIO TOOTHPICK HOLDERS: Cute ceramic figures of a dog listening to a radio with headphones. The first 3 are different versions, made in Japan 1920's?. They are 3 inches wide. The fourth is made in Germany and may be a Gommel?, this one is very hard to find. PLASTER RADIOS: Left is an ADDISON, 2nd an Emerson, 3rd a FADA - sold, 4th Xmas ornament -sold, 5th a cathedral radio - sold. MISC. RADIOS: First 3 are refrigerator magnets, 4th doll house radio, 5th is wood, 6th is plastic. Last 2 are sold. GILBERT TUBE PUZZELS: A.C. Gilbert Radio Tube Tricks, has 4 holes to get tubes into holes. First is metal, others cardboard. Priced according to condition. MAJESTIC BANKS: Cast iron banks from Majestic Radio Co., made in 1930's. All in good or better condition. PLASTIC RADIO BANKS: Colored plastic radio banks of unknown age. All in good or better condition, 1st on left is sold. RADIO NOVELTIES: First two are Xmas ornaments, hung by rope in top hole. Next three are doll house furniture radios, last missing slide out drawer. All sold except 2nd of left. 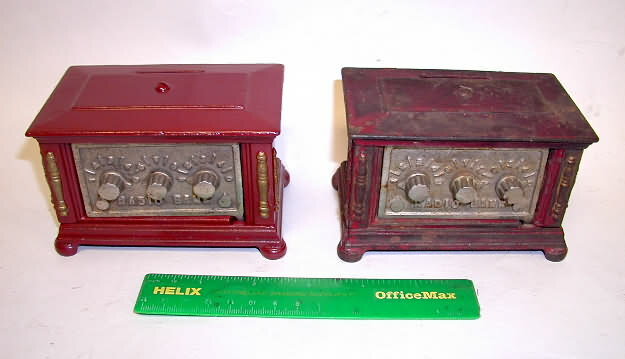 RADIO BANKS: Cast iron radio banks from Kenton Co., made in 1920's. First one has been repainted, 2nd has original paint (fr++) and is missing door latch (does not effect display of it). 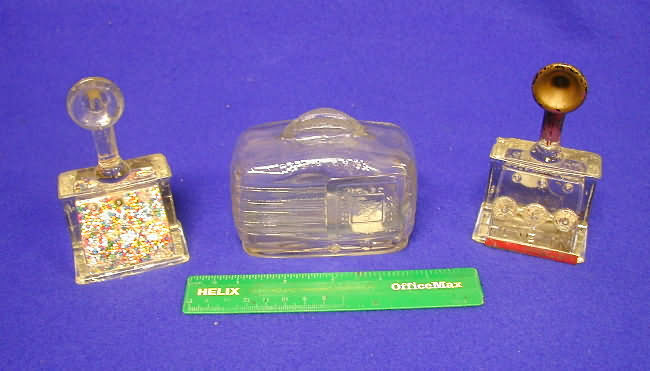 RADIO NOVELTIES: Left is a 1920's TUNE-IN RADIO candy container, missing bottom plate, 2nd is a glass radio bank, 3rd is another candy container with metal bottom. 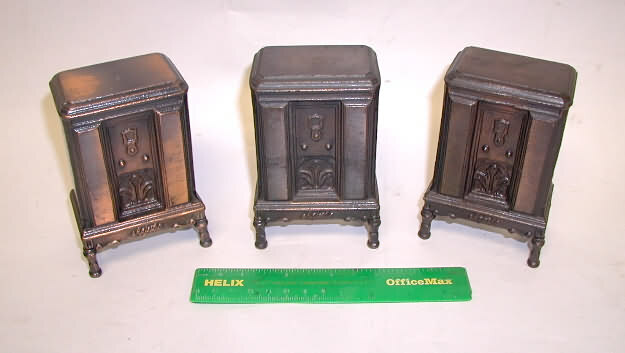 RADIO NOVELTIES: Plaster cathedral radio planter, 2nd is a wood TV, 3rd is a console radio bank by Helsyl.